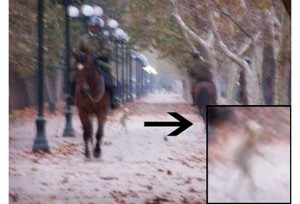 A blurry photo can be the starting point on an entire conspiracy theory, and, in this particular one, the accidental capture of a small, seemingly alien creature in Santiago Chile, Parque Forestal seems to be suc a picture. The picture itself, taken with a mobile device and rather geared towards capturing the drills of on-horse police officers shows a small creature with a relatively large head in proportion to its body. It has the grayish colors of what we have usually come to describe as “The Grays” the aliens which are seen on many occasions by these which claim to have been abducted by aliens. What is remarkable however is the fact that the creature seems to have spotted the individual capturing the picture and seems to be interested in evading the frame or trying to leave the scene as fast as possible. We don’t think that the picture has been faked, but, at the very same time, due to how grainy it is, it is very unlikely that the almost shadow like creature be nothing more than an interesting yet benign arrangement of the leaves which already cover the alleyway in a large proportion. Therefore, the perspective, the fact that the picture is very rainy and that the scene itself is shot on an alley way full of dead leaves, makes it much more likely that what we’re seeing is an optical illusion, an interesting and fortuitous one, but, nevertheless, an illusion. Chile has had a few other sightings which haven’t always been elucidated, but, for the most part, the country hasn’t seen so much unidentified activity in the past. Therefore, as always, we urge prudence in interpreting the facts and a keen eye on the facts, in order to make sense of these situations and evidence. Are Aliens and Biblical Demons the Same Things? The world is going through a tough stage. Our world is crumbling apart. Many forces are making efforts to stop the mankind from believing in what is true. If you still think that . The Cherry Creek UFO Incident There aren't many UFO reports about a UFO that floats right above the ground or actually lands. An excellent report about this type of appearence with multiple eyewitnesses is the Cherry Creek UFO Incident of 19 .